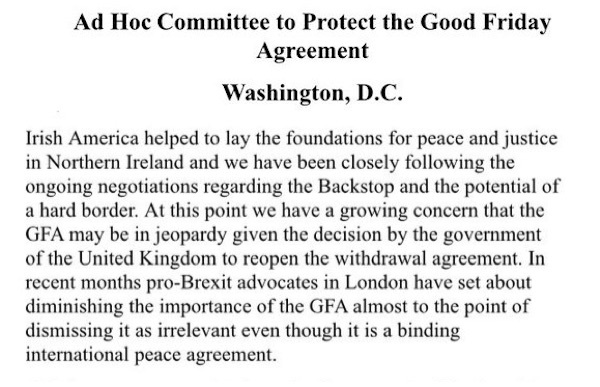 A committee to protect the 1998 Good Friday Agreement has been established by a group of leading Irish Americans in the wake of what they describe as the erosion of the deal by Tories, “almost to the point of dismissing it as irrelevant even though it is a binding international peace agreement”. The new ‘Ad Hoc Committee’ has sent a letter to British Prime Minister Theresa May and 26 County Taoiseach Leo Varadkar outlining their concerns regarding the ongoing Brexit negotiations. They warned that a border would “resurrect the memories” of the militarisation in the north of Ireland during the conflict. The committee involves US Republicans and Democrats, and includes two former US Senators, five former US Ambassadors, leaders of prominent Irish American organisations, and former US Senator Gary Hart, who acted as the Special Envoy for the North for then US Secretary of State John Kerry. “The recent decision by the Prime Minister and the Parliament to seek to re-open the withdrawal agreement and find an alternative to the backstop has put the Good Friday Agreement [GFA] into play. This alarms us,” said former member of Congress James Walsh, a co-chair of the Ad-Hoc Committee. At an event in the US capitol building on Wednesday night, senior figures in Congress separately warned Britain that its hope of striking a trade deal with the US after Brexit would be in jeopardy if the Good Friday Agreement is compromised. “If the British want to consider any type of trade agreement with the United States it is important that the soft border is maintained,” Republican congressman Peter King said at an event to mark 100 years of the Dáil. “What influence we have, we will use it,” he said. His warning was echoed by Richard Neal, the Massachusetts congressman who was recently appointed chairman of the Ways and Means committee. His committee has sweeping powers over US trade policy, and would have ultimate oversight of any trade agreement signed between the US and Britain after Brexit. Mr Neal said that concerns about the Good Friday Agreement would “weigh on his mind” if the committee were considering such a deal. The US is Britain’s main trading partner outside the EU bloc, and exports to the US are worth an estimated 100 billion pounds to the British economy each year. Congressman Morrison also warned Britain about the difficulties ahead in negotiating a trade agreement with the US, something Brexit supporters see as a benefit of leaving the EU customs union. “I think the British have made a lot of assumptions about trade agreements with the US and with other countries and frankly, from a hard-headed economic standpoint, dealing with the EU is a lot more important than dealing with Britain, so I think they have an uphill slog on that,” Mr Morrison said.